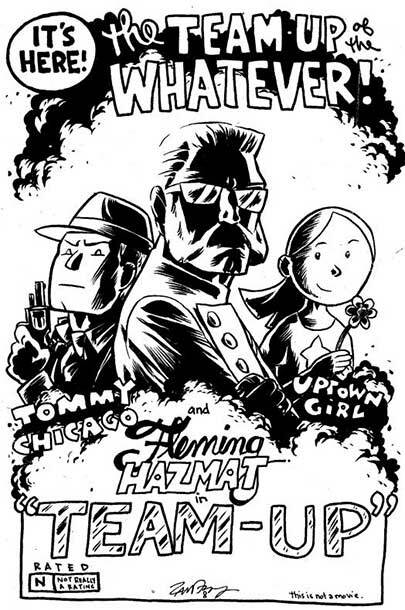 Big Time Attic: Zander's Fleming Hazmat/Tommy Chicago/Uptown Girl pinup is online at Staplegenius! Zander's Fleming Hazmat/Tommy Chicago/Uptown Girl pinup is online at Staplegenius! Some time ago, Danno Klonowski asked me to do a pinup for his massive crossover adventure that brought three of the best minicomics characters ever together for a romp through space and time and whatever, and so I said sure. I love drawing these characters, and in particular you may notice how similar Fleming Hazmat looks to a certain lieutenant who now graces the deltoids of a certain cartoonist. And you should definitely go about reading the entire book here at Staplegenius!